Everyone’s going to hate me. It is officially the most depressing day of the year – Blue Monday – that dismal point in mid-January when divorces, debt and lethargy are all supposed to peak. But I’m in Barbados. Barbados! The previous morning I’d shivered on the train to Gatwick, chugging through snow-covered countryside; now I can’t resist a horribly smug social media post pointing out that the only things blue about my Monday are the sky – a cloudless, gas-flame blue – and the sea – deep turquoise, clear as glass. Sunshine and beaches are, of course, the two main reasons most people choose to visit Barbados. But as one of the bigger and more developed Caribbean countries, it has several different sides: designer shopping and clubbing in Holetown (watch out for the potent lemon drop shots at The Mews restaurant – a punchy combination of vodka, lemon juice and sugar, set theatrically aflame); surfing on the rugged east coast; exploring ruined windmills and rum distilleries inland; or simply holing up in the west coast’s luxury resorts. It’s a far cry from Robinson Crusoe territory, but for every fast-food chain or flash fine-dining hotspot (Lone Star and The Cliff being two of the best), there’s a ramshackle joint serving flying fish sandwiches and local beer to be found (try Cuz’s Fish Shack at Needham’s Point). While mention of a holiday in Barbados inevitably draws envious/longing/enraged expressions from friends, by far the most common response I had to the second destination on my Caribbean trip was a baffled “where?” To be honest, I didn’t even know how to correctly pronounce Bequia until I got to Gatwick and a fellow traveller set me straight (turns out it’s ‘beck-way’). Therein lies its appeal: not many have heard of this tiny lightning bolt-shaped island in the Grenadines or know how to get there, and fewer still have actually visited. Unlike celeb-packed neighbour Mustique, it has remained thoroughly under the radar. Millionaires reside in its remote pastel-coloured villas and bring their yachts into its bays, but there is none of the ‘scene’ of Barbados, none of the luxury brands – nor a single set of traffic lights, for that matter. Wi-fi aside, locals agree the place hasn’t really changed for 50 years. The contrast is immediately apparent when you touch down at Bequia airport. There’s just one runway, one passport desk in the arrivals room, a single conveyor belt for luggage, and no shops. Instead of taxis and tourist touts, there are a few goats grazing on the lawn outside. There aren’t any direct flights from Europe, so we had taken a 40-minute flight from Barbados on a 21-seater aircraft, soaring low over swathes of deep blue sea and tiny, tree-covered outcrops that hadn’t a single building on them (only nine of the Grenadines’ 32 islands are inhabited). 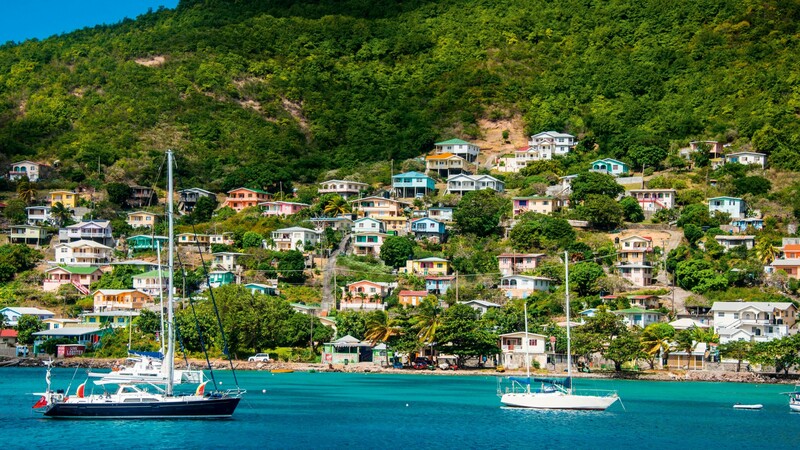 When people do manage to make it to Bequia, they fall in love. Case in point: Bengt Mortstedt, a Swedish lawyer and property developer who dropped anchor in Bequia’s Friendship Bay on a sailing holiday and decided it was the perfect spot for a hotel. Fast forward 20 years and, in Bequia Beach, he has created a relaxed oasis with 59 colonial-style guest rooms and villas set in lush gardens – keep your eyes peeled for resident cat Diva strutting around the pool. 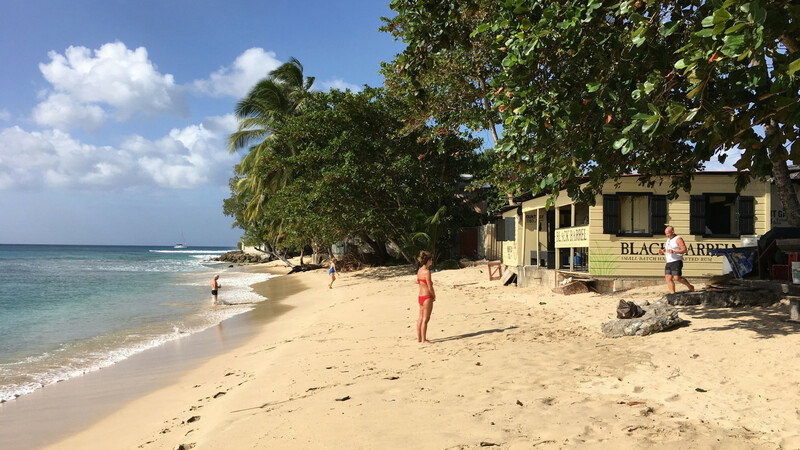 Evenings in Bequia centre around beach bars and barbecues – occasional bright pockets spilling the sounds of steelpan drums and clinking Hairoun bottles (the local beer) out into the night. Once the rum punch started flowing at Bequia Beach’s veranda restaurant Bagatelle, dinner culminated with guests kicking off their sandals and dancing barefoot on the sand, while St Vincent musician Andy gave impressive renditions of everything from Otis Redding to Rihanna. He did, however draw the line at my request for a Taylor Swift number. Understandable. The next day I wish I’d gone a bit easier on the cocktails as we rattle around the hilly island in a safari-style truck, tackling some of the steepest roads I’ve ever seen, all the way up to the Mount Pleasant lookout point. With nothing but lush forest beneath you and views across the sea to St Vincent, it’s worth the nerve-jangling drive. A single day’s tour can easily take in the whole island, a mere seven square miles, and on our way we see the crumbling shell of an old sugar plantation, learn the names of the flame-coloured ‘pride of Barbados’ flowers and calabash trees laden with fruit like bright green rugby balls, pop into a turtle sanctuary and even see a minor road accident abated; a woman behind us gets her tyre stuck in a roadside ditch and within minutes half the village is out helping push the car back onto the track. Everyone is laughing. I guess it’s hard to be stressed here. But let’s face it: nothing is going to excite a pale, urban-dwelling Brit like myself as much as a good beach. 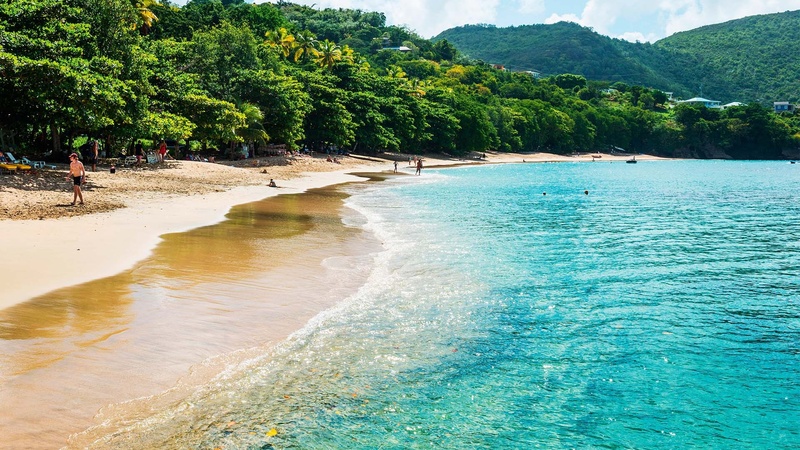 Out of the countless postcard-perfect stretches of sand to be explored on Bequia, one of the nicest is Princess Margaret Bay, named after the royal who took a dip there during her honeymoon. Anywhere else, and this prime location surely would have been consumed by hotel developers, but in the typical Bequian way there is merely a single beach bar, Jack’s, and the rest of the bay is fringed with cedar and almond trees. Even the island’s ‘capital’ of Port Elizabeth feels more like a village, with its market stalls selling fruit and veg, seafront boardwalk and fishing boats. The brightly painted houses tumbling down towards the shore bring to mind the Amalfi coast. On the way back to the hotel, we pass a young man sitting on a wall beside the road. Naturally, we Londoners assume there must be a reason for his loitering and there’s much speculation about what he’s selling, or who he’s waiting for, until eventually someone goes and asks him. “Just sittin’,” he replies bemusedly, as if any other reason is needed. Just sitting. I can’t remember the last time I ‘just sat’ back home, not facing a laptop or TV screen, flicking through my phone or waiting for a bus. I vowed that this is just one little bit of the Bequian outlook I would try to bring back with me.